Lowy presents another war victim, a frightened civilian caught in the green haze of military-issue lenses that render him visible in the dark. Or is this a dangerous enemy? The night-penetrating technology lets me see and connect with the human subject but weirdly distances him at the same time. I’m witnessing the plight of another, secure in my own identification with the well-armed photographer, allied with the powerful soldiers, teetering on the edge of compassion. It’s an equivocal position. Is this the visual fog of war? With an institutional surveillance camera, however, moral values of fairness and reciprocity are beside the point. The same goes for concern and respect. The camera looks. Who can resist? Several photographers in the “Surveillance” section assume this position of relative power, setting up psychological dramas of potential danger or suspense. Yoko Ono has a silent cameraman follow and harass a young woman to the point of collapse. Bruce Nauman’s monotonous video of an office at night keeps frustrating my expectations that something, even the fleeting appearance of a fugitive mouse, will happen. 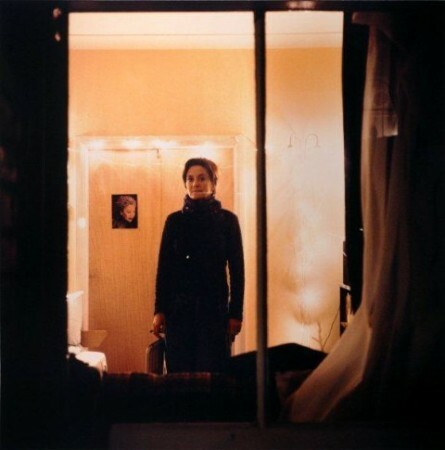 Sophie Calle arranges to be followed by an unwitting private detective, contrasting her journalistic jottings and longings with the detective’s dull photographs and dry notations. The “surveillance-style” images in Exposed put on view the experience of being surveilled as a psychological relationship, almost a dance with that irresistible camera. If the surveillance society is the new normal, we seem fully capable of agreeing to its everyday exposures. Some people perform exhibitionistically; most expose themselves more modestly on social media. Is this voluntary self-exposure (explored in the Walker’s 2010 Talent Show) a healthy adaptation to the society we live in? Do the images we post stand roguishly against the boring dataveillance about us that circulates uncontrollably in the cloud? Contemporary surveillance by an institution is absent from Exposed. The declassified spy photographs included are old Cold War documents, the stuff of legend and vintage foreign affairs. There are no irradiated airline passengers, protesters at global trade negotiations, red-light runners, terrorists at the tube station, or simply ordinary folk making their way in the photographically visible world. Without actual surveillance footage to compare to the make-believe scenarios of “surveillance style”, it’s hard to think about the difference between them, between one human looking voyeuristically at another, and a robot machine impartially monitoring everyone. Do the proliferating new panopticons make us behave? Who controls them? If we can’t sense them, can they really see us? What’s the relationship between surveillance and citizens, consumers and other human subjects? What Exposed does include include are photographs that turn the tables on the powers behind surveillance, or try to. Flesh and blood photographers look through their lenses at the sometimes barely visible institutions that transcend and know us all.